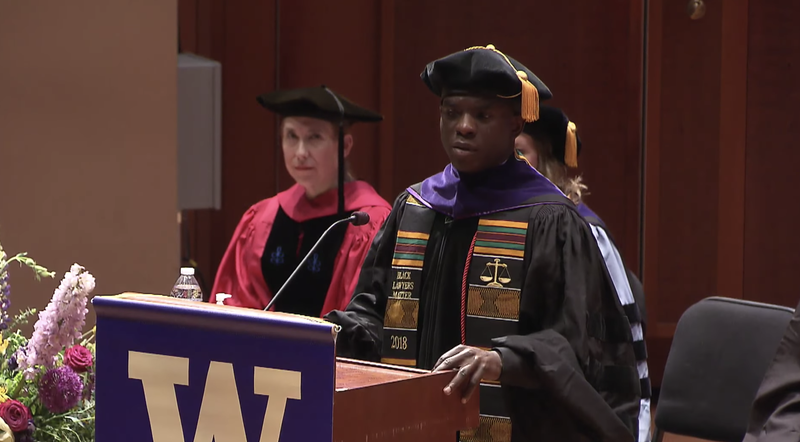 One of the “Jena Six,” Theo Shaw gives a commencement address at the University of Washington Law School on June 3, 2018, in Seattle. One of the six young men jailed for allegedly participating in a racially induced fight in Louisiana some years ago has graduated from law school and gave the commencement address Sunday. Theodore Roosevelt Shaw was 17 in 2006, one of the so-called Jena Six, who made international headlines after the charges brought against him and five of his friends were determined to be especially punitive. Shaw and his cohorts were accused of attacking a white classmate in a racially charged incident at the school, where blacks were greatly outnumbered, a crime that the young man said he did not commit. Yet Shaw and his friends were initially charged with attempted murder, even though the young man who was attacked walked out of the hospital that day. According to the New Orleans Times-Picayune, Shaw pleaded no contest to simple battery, but if he had been found guilty on the original charge, he could have been imprisoned well into his 60s. However, that was not to be his fate. At age 29, he was the chosen student speaker of the University of Washington Law School class (Shaw’s portion begins at about 29:00). During his speech, Shaw talked about his internship with the Innocence Project New Orleans, which works to exonerate the unjustly convicted, and visiting men who spent decades in prison for crimes they did not commit. “As agitators, we have to speak up for those who will never have access to the privileges we enjoy as lawyers,” he said. Emily Maw, the executive director of Innocence Project New Orleans, was in the auditorium Sunday with her husband, attorney Rob McDuff, who worked on Shaw’s plea deal, and they watched him lead his classmates into the room. Shaw, who spent time in a juvenile facility in relation to the case, says that he was introduced to the law while incarcerated. He borrowed a law book from another inmate and began writing motions to get the judge to lower his bail. He said in an interview before law school that he felt a rush of power when he realized that even as a poor, uneducated, incarcerated teenager, he could write something that compelled a judge to respond—if only to say no. Shaw will return to Louisiana to clerk for the highest-ranking judge in the state this summer as well as study for the bar.